Federal Government, FG Awards School Feeding Programme to the Centre for Food Technology and Research (CEFTER), Benue State University, Makurdi. The Centre for Food Technology and Research (CEFTER), Benue State University, Makurdi has been awarded contract for the production of soyabeans yoghurt for the Federal Government School Feeding Programme in Benue State. Consequently, the Centre has acquired the premises of Final Yoghurt Factory, Makurdi on a one year lease agreement for the production of the product to be supplied to primary schools in 23 Local Government Areas of the State. 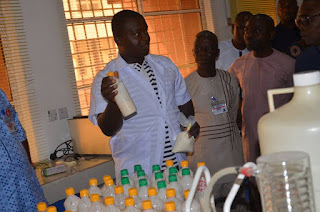 Speaking during an inspection visit to the premises of the factory on Tuesday, 15, 2019 by the University Management, the Centre Leader, Prof. Daniel Adedzwa explained that the soyabean yoghurt is a product of students annual Food Week and Exhibition by CEFTER. According to him, the initiative is as a result of collaboration between the Centre and the Social Investment Office of Benue State which is the agency directly in charge of the Federal Government School Feeding Programme. In a remark, the Deputy Centre Leader, Operations Dr. Barnabas Ikyo disclosed that under the terms of the contract, CEFTER is expected to produce 574,000 sachets of soyabean yoghurt to be supplied to 23 Local Government Areas of the State every Wednesday of the week. He pointed out that in view of the fact that the Final Yoghurt Company premises had been abandoned for years, it is presently being rehabilitated to make it habitable. “Already, the water treatment and yoghurt sections have been revamped preparatory to a commencement of production”, he said. Dr. Ikyo further explained that a new section meant for the grinding of the soyabean is under construction stressing that the Centre had already deployed five (5) academics, three (3) PhD students as well as ten (10) CEFTER students on internship to the factory. Responding, the Vice-Chancellor, Professor Msugh Moses Kembe commended CEFTER for the initiative adding that this could be another stream of revenue for the University. According to him, the venue is a positive mark on the image of the University even as he enjoined the Management of CEFTER to begin to explore other avenues of sustaining the project in case of policy change on the part of government. The Management also visited the Food Analysis Laboratory in the University where the processed soyabeans yoghurt was undergoing laboratory test for production.